This page links to many print, video and audio interviews. Explore all the way down the page! David Foster Wallace: The Last Interview and other conversations. Ostap Karmodi's Russian interview with DFW. The New York Review of Books has an edited version, A Frightening Time in America: An Interview with David Foster Wallace, and now Ostap Karmodi has posted the full text on his blog. Brief Interview with a Five Draft Man Spring 1999 Amherst Magazine interview. Boston Pheonix Transcript Interviewed by Tom Scocca Feb 98 - Full unedited transcript posted on Slate.com Nov 2011 by Tom Scocca. The Harvard Advocate Interview Spring 1997. The Whiskey Island Magazine interview was conducted by Hugh Kennedy and Geoffrey Polk and printed in the Spring 1993 edition of the Whiskey Island Magazine. It is made available with the magazine's permission. Bill Katovsky's interview from the April 1987 issue of Arrival and can be found over at McSweeney's - David Foster Wallace: A Profile. University of Arizona Poetry Centre Remembrance. Audio 1st May 2009. Uploaded / appear online 1999 (Recording date unknown) One of a series of short interviews (apparently available online sometime soon) with Wallace by Bryan Garner, this one is about 'Prior To'. ZDF Interview - A Short version screened on zdf, here is an English translation. Later an unedited/extended version was posted online by zdf. All 84mins can be viewed on YouTube (part 1of 9) 9 parts. Full video link. David Foster Wallace on the Charlie Rose show: 17th May 1996 (highlights) and 27th March 1997 Part 1, Part 2, Part 3, Part 4. 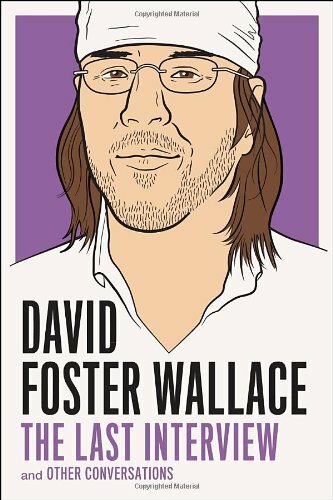 Ryan Walsh's DFW audio collection The David Foster Wallace Audio Project, includes much of the audio below and more (but, alas, some of it undated and without reference to the original location). Update Feb '13 - Creating The David Foster Wallace Audio Project. Endnotes: David Foster Wallace documentary airdate 6/2/2011 listen via YouTube. 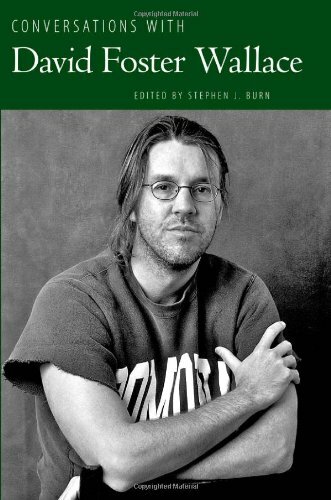 Lannan Foundation Everything and More: A Tribute to David Foster Wallace. Featuring David Lipsky, Rick Moody, Joanna Scott and Michael Silverblatt 16/3/2011. Video highlights of the University of Arizona / Sonora Review / Poetry Centre Remembrance. Full audio link. 1st May 2009. To The Best of Our Knowledge David Foster Wallace Special May 2009. Amy Wallace-Havens. KCRW Silverblatt Interview 2nd March. Wallace speaking with NPR on August 19th, 2006, about his Roger Federer essay. Wisonsin Public Radio To The Best of Our Knowldge Interview. April 2005. May 8 2003: John DAgata (Editor of The Next American Essay, including 'Ticket to Fair' by DFW) interviewed on Michael Silverblatt's Bookworm show. Including a guest reading by DFW. Wallace interview with NPR's Talk of the Nation, Infinity, about Everything and More: A Compact History of Infinity. December 2000. DFW readings available at the Lannan Archives. He reads 4 things, 3 awesome fragments of unpublished material (that ended up in The Pale King) as well as Incarnations of Burned Children. The recordings are of extremely high quality and very funny! Michael Feldman's Whad'Ya Know? from April 5, 1997. Whad'Ya Know podcast Soundcloud page. Transcript available here at Bob Wake's, "Infinite Jest: Reviews, Articles, and Miscellany". Audio at Eyeshot.net. There are a number of links to DFW audio. Audio Excerpts of DFW reading from Brief Interviews with Hideous Men: "A Radically Condensed History of Postindustrial Life" and "Death Is Not The End" are read. Broken Links or Finds? Report them here.